You might be thinking, “What the what, CollegeXpress?! Student loans are not financial aid!” Well, some actually are considered aid, like federal loans with deferred interest. But more importantly, you need to know where loans fit in the grand scheme of paying for college. In short, loans should be your last line of defense, and if it does come down to borrowing money to pay for school, you need to do so smartly . . . Consider your career. Even if you’re not entirely sure what you’ll be when you “grow up,” you probably have some inkling. Look into the field(s) that interest you and their average starting salaries and hiring prospects (usually pretty easy to find online). Then compare those numbers to what you’re considering borrowing. For example, $100,000 in debt isn’t tenable on a $30,000 salary; $3,000 in debt on a $45,000 salary probably is. Consider your college. What are the average four-year graduation, default, and placement rates for recent grads? What does the school’s career services office offer? In what companies and positions are recent grads working? Though your future will be what you make of it, these indicators can shed some light on how your college might impact your future ability to repay your loans. Investigate federal loans first. With the possibility of deferred interest (and lower interest rates in general), income-based repayment upon graduation, and even debt forgiveness, federal loans are generally preferable to private ones. Investigate credit unions and community banks second. You might get a better interest rate and overall deal than big student loan companies or national banks. Pay down your loans as a student if at all possible. Even if it’s just interest payments, every little bit helps. Trust us: your 30-year-old self will thank you. And there you have it, the end of Financial Aid Month 2015. 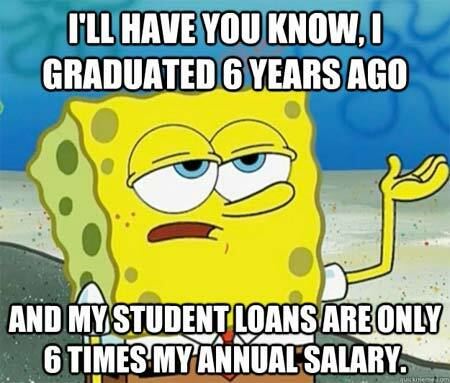 But you can keep coming back to CollegeXpress for more financial aid help and to search for scholarships all year long!